Are you hunting for the latest MBA Jobs 2018? we hope you have landed at the right place. On this article, we have given the current Job Openings for MBA Freshers in a detailed manner. Generally, many of the IT companies such as TCS, Microsoft, Oracle, Google, Wipro, Dell, Deloitte, Capgemini, Hewlett Packard (HP), IBM, and some other are looking for the MBA graduates. These companies are willing to hire the candidates with good skills. 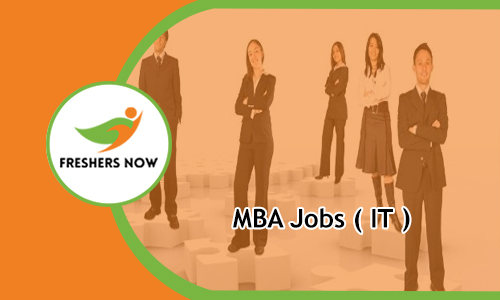 To help the aspirants we are providing the latest and upcoming IT Jobs for MBA freshers in a table format. So the aspirants who are hunting for the MBA Freshers Jobs can apply for the vacancies by checking once. We tried our best to provide the latest opportunities at one place. For more details about MBA Jobs 2018 scroll down the page and get the details without any hesitation. Are you looking for the right career option after MBA? then we hope you are at the right place. This page is the one stop place for the aspirants to find out the latest MBA Jobs 2018 in various major cities. There are hundreds and thousands of opportunities for the MBA graduates in the Information Technology (IT). The aspirants who are in search of the job can check this page completely without missing a single point. Nowadays there is high demand for the IT Jobs. The business around the world is increasingly using the Technology to the competition. Many of business oriented companies are choosing the internet as the platform to expand their business. To become a part of the IT company aspirants can check out this post fully. Master of Business Administration is abbreviated as MBA. This is also known for the Master’s Degree in Business Administration. The MBA is a Professional Degree or Terminal Degree. Aspirants who choose the Master of Business Administration as the higher education can cover various areas of the business. The areas are such as business ethics, managerial economics, applied statistics, finance, marketing and operations, accounting, business communication, business law, management. At present most of the candidates are showing interest to do MBA in reputed colleges to become a professional. Candidates who completed MBA anywhere across India or abroad will have a hand full of opportunities. In this page, we tried our best to provide the area wise job openings for MBA Freshers. We request the candidates to check this post without any other disturbance. In this page, we are providing the basic information regarding the MBA Jobs 2018. After completing the MBA the candidates can start their job career in various sectors they are Marketing, Finance, Computer System, Accounting, Human Resource (HR), E-Business, Leadership, International Business, Entrepreneurship, Technology Management etc. But the MBA IT Graduate can start his career in any of the fields in IT companies such as IT Governance, Sourcing, IT Financial Management, IT configuration management, and IT Service Management. The MBA Freshers can climb up the ladder only if they have enough skills in the business environment. So for the convenience of the job hunters, we have updated the each and every job opening on this page. For more MBA Off Campus Drives, be in touch with our website. The competition for the MBA Jobs 2018 is very high. We request the aspirants to check this page thoroughly to get the current openings across various MNC’s or small companies. There are various companies which are looking for the MBA freshers with the good job oriented skills. The aspirants should have a technical set of skills in Information Technology. This is the very important thing the MBA Graduate have to remember while going to apply for the MBA IT Jobs. Candidates can start with the basic positions and later on move for high positions such as IT Directors, IT Managers, Chief Technology Officers (CTO) and Chief Information Officers (CIO). Contenders check the recent available Job Openings for MBA freshes on this page. The candidates who complete the MBA in top colleges can get the job in any of the Multinational companies easily. But the aspirants who done in the normal colleges have to put maximum efforts to get the job as MBA Fresher. For the easiness of the aspirants we are also providing the MBA Walkin Drives across India of various companies. We hope the aspirants can get the latest stuff related to the jobs from this page. Interested candidates can check the eligibility criteria and go to the application process. While going through the details of particular opening the aspirant has to check the educational qualification, skills required, roles and responsibilities of certain positions carefully. To crack the job the aspirants have to clear the written test and personal interview. To help the aspirants in their preparation we are providing the each and every company Syllabus and Placement Papers on our website. Along with this stuff, the candidates can also get check the Interview Questions. This will help to be the first one to clear the rounds of the selection process. Due to a large number of openings available on our website many of the aspirants are in confusion. To put an end to all their thoughts we have given the procedure to apply for the MBA Jobs 2018. By clicking on the links the aspirants can find out the complete apply procedure in an understandable manner. To get the regular updates the aspirants can be in touch with our website Freshers Now on regular basis.